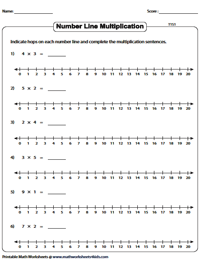 This compilation of number line worksheets have been meticulously created to help young ones fine tune their skills at multiplication. These fun-filled worksheets include reading the number line, indicating hops on the number line, find the missing numbers, solve the multiplication sentence and much more! Use the various download options available for a delightful learning experience! 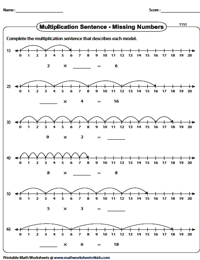 Indicate hops on the number line to solve each multiplication equation. Type 1 worksheets contain number lines that range from 0 to 20. Type 2 has numbers displayed in multiples of 2,3 up to 10. Each Type 2 worksheet includes illustrated example. Observe the hops on the number lines and write down the missing multipliers, multiplicands or products to complete the multiplication sentences. 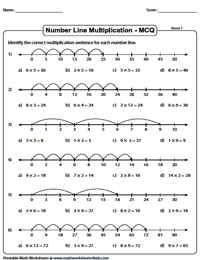 The number line worksheets are categorized into two levels based on the increments on the number line. 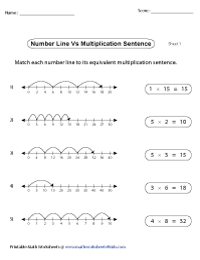 Interpret the number lines in order to write the correct multiplication sentences. The worksheets have been split into two levels based on the increments. 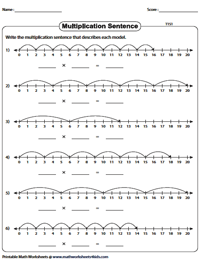 Identify the correct multiplication sentence for each number line featured here. Use the 'Download the set' option to test your comprehension on multiplication. Verify your responses using the answer key provided. Pair the multiplication equation on the right column to its equivalent number line on the left. Kids will have truly mastered multiplication with this array of worksheets!